Revamped iPod Nano to Include Oblong Body with Home Button? 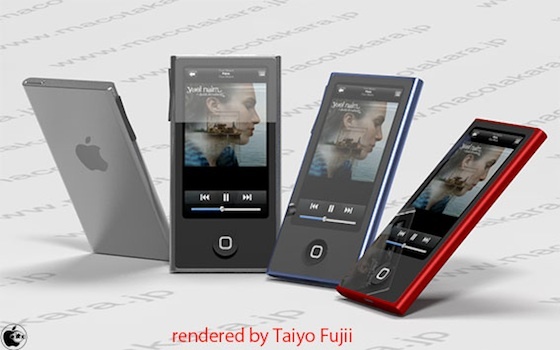 Japanese blog Mac Otakara reports that Apple will be redesigning the iPod nano later this year with a new form factor that more closely resembles an iPod touch. According to the report, the iPod nano will apparently sport a rectangular screen and a home button similar to that found on iOS devices. Given that the screen size on this redesigned iPod nano would appear to be substantially smaller than the iPhone/iPod touch, it seems unlikely that the iPod nano would run iOS apps. Instead, Apple is likely to use a custom operating system and apps skinned to resemble iOS as found on the current incarnation of the iPod nano. The report also indicates that Apple will be bringing a "dedicated new iTunes service" to the device, but there is no word on what that service would entail. Apple's iPod lines have generally trended to smaller form factors with each redesign, but this rumored redesign would appear to mark a substantial increase in size from the current form factor, which was introduced in September 2010. Several leaked photos have suggested that Apple planned to add a camera to the smaller form factor, but it appears that the company may have ultimately scrapped those plans. It would not be unprecedented, however, for Apple to decide that smaller is not necessarily better, particularly if the iPod nano can see increased functionality with the new design. Apple famously removed virtually all buttons from the iPod shuffle in March 2009 as it moved controls to the headphone cord, but a September 2010 redesign saw the return of the click wheel and other on-device buttons. hopefully they go back to this design and get the video recording again. I love being able to snap photos and take videos on something that small, even if it's just silly stuff like foxes and eerie empty streets when I'm out running at night. Or if you see an accident or something when you're out for a jog, it's nice to be able to record it. Apple is making a Zune? While I know it's just a quick render, that thing looks just 'meh'. Kudos for the use of 'oblong' though, it's not every day you see that word used in a headline. The current Nano was an interesting experiment but the fact it's been more popular as a makeshift wristwatch says it all. This mockup would be a much more natural/ergonomic form factor. I think that mockup looks really cool, click wheel will always be my favorite though. The click-wheel was/is a brilliant, brilliant interface. They had it perfected! Agree agree agree. Getting rid of the click-wheel marked the end of an era.